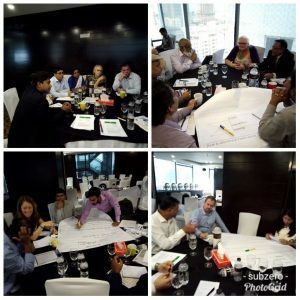 A4NH's Food Systems for Healthier Diets (FSHD) Research Flagship convened a meeting of stakeholders in Bangladesh to provide an update on progress and strategize about next steps in work to understand the nuances of the country's food system and areas for intervention. The meeting, held in Dhaka in November, gathered together more than 50 representatives from government agencies, research institutions, nongovernmental organizations, and others. The first part of the day included an overall program update from Inge Brouwer, FSHD Flagship Leader, as well as presentations on and discussions about dietary gap analysis, impacts of climate change on food systems, and the SUN Movement approach. The session continued with dedicated time to discuss issues and innovations, including gender and trust in input markets, and the results of the food system policy baseline survey. The day concluded with a question and answer session that dug into food system concerns for Bangladesh and then group work on innovations. A second meeting for stakeholders was held one day later, in a workshop format on Platforms for Healthier Diets. Organizers convened the session to share findings of the web- and desk-based review of platform initiatives, showcasing the broad range of approaches to working on food security, food safety, nutrition, and agriculture. Armed with the review findings, the nearly two dozen attendees engaged in mapping exercises that applied their knowledge of food system issues and details to three platforms. Groups identified ways to deepen partnerships and better understand the influential agencies involved across the platform. The two meetings were organized for A4NH by Wageningen University & Research, which leads the FSHD flagship, and the International Food Policy Research Institute, which leads A4NH work in Bangladesh. In addition to stakeholder meetings, FSHD also held a day of internal dialogue on progress on the draft of the forthcoming paper on Food Systems in Bangladesh, due in early 2019. More information is available from the stakeholder meeting and the platform workshop.